"Speed Reader-XÂ® is an efficient and to-the-point training system that concentrates on speed techniques. It uses the latest software which is designed to help you practice speed reading exercises. The human brain is capable of taking in information much faster than the average person can read. Speed Reader-X teaches a new, visual method of taking in information. Speed Reading is not pushing harder. It is a new method of viewing words and sentences. Do you find yourself reaching the end of a paragraph and realize you have no idea what you just read? Your brain became bored and tuned out what you were reading. Speed Reader-X will retrain your brain to take in information as fast as it can. The Speed Reader-X Training System can be used by anyone with a third grade reading level or higher. It is for children, teens, college ages and adults. There are many speed reading systems that claim you can double your reading speed in five or ten minutes. The truth is anyone can double their reading speed anytime without any instruction. You simply push harder and read faster. There is no trick to that. The problem is that you cannot sustain this reading method long enough to read a book or magazine. Speed Reader-X gives you a new way to look at words and take in information without that little voice in your head slowing you down. 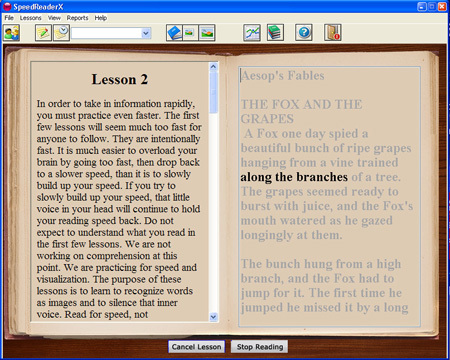 Speed Reader-X is designed to make learning speed reading fast and easy. The system consists of 10 lessons. The lesson objective is explained before the lesson begins. You then practice the lesson using the software. As your eyes scan the text on the screen you are un-learning bad habits and learning new, good habits. You click the Next button, words flash and you begin to quickly overcome the roadblocks you were taught in school. The software helps you retrain your eyes to move smoothly over text without stumbling over words. After completing each lesson, you can see your results on the screen. It couldn't be easier." Complete and fully interactive typing tutor, enabling you to learn and develop a fast and correct typing skill using your own computer in a practical and fun way, typing games included! calculates the prime numbers 1..N, tells you if N is prime etc. Prints tables of primes. Computes the prime just below or above N. calculates the prime numbers 1..N, tells you if N is prime etc. Java classes to let you create a custom utility to find and delete all junk files on your machine. This program requires some elementary Java programming skill. The offline environment provides you to practice many times and also keeps you away from always connecting to the internet. SCEA Part 2 & Part 3 Exam EPractize Labs ? covers the following features for preparaing SCEA - Sun Certified Enterprise Architect for the Java 2 Platform, Enterprise Edition Part 2 assignment exam and Part 3 essay exam. SCEA Part 1 Exam EPractize Labs ? This simulator covers the following features for preparaing SCEA - Sun Certified Enterprise Architect for the Java 2 Platform, Enterprise Edition Part 1 multiple choice exam. SCalc is a simple spread sheet program. The user interface applies the UNIX curses library for control of a terminal screen in text mode. This site does not contain serial number, crack, keygen Speed Reader-X serial number : serial number is the simplest type of crack. A serial number(cdkey,product key,etc) is register the program as you may already know. a crack or keygen may contain harmful software. If you cannot find the exact version you want, just give it a try. for more information read .nfo/.txt/.diz file include in zipped file.